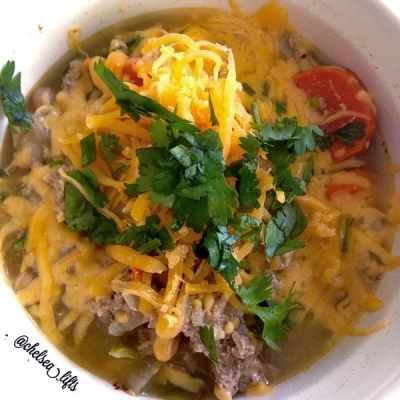 White Bean Lean Ground Turkey Chili slow-cooked in a clear Chicken Broth with Carrots, Celery, and Onion. Topped with Shredded Fat-Free Cheddar Cheese and fresh Cilantro. In a crock-pot on the high-heat setting, add ground turkey in with all spices and seasonings as well as all diced vegetables. Mix all ingredients together, cover, and let cook on high for one hour. After the hour, add in the chicken broth and cannelloni beans, mixing all ingredients again, recover, and let cook on low heat setting for an additional three hours. At this time the vegetables should be soft, if not, turn back up to high heat and continue cooking until all ingredients are softened. Once finished, portion out and top with Shredded Fat-Free Cheddar cheese and some Cilantro leaves.